Born 1953 Cardiff, Wales, Peter Fraser attended schools in Cardiff, Glamorgan and the Rhondda Valley. He acquired his first camera at the age of 7, and after a false start studying Civil Engineering, at 18, began studying photography at Manchester Polytechnic the following year. In the summer of 1974 he lived in New York and worked at the Laurel Photography Bookstore at 32nd St and 6th Avenue which significantly expanded his sense of photography’s expressive possibilities. He graduated in 1976 after repeating his 3rd year due to major illness crossing the Sahara, while photographing in West Africa. He then worked on several series of photographs, leading to a first publication, Two Blue Buckets (which featured work from, 12 Day Journey, The Valleys Project, Everyday Icons and Towards and Absolute Zero) which won the Bill Brandt Prize in London (the precursor of the CitiBank International Photography Prize), in 1988. 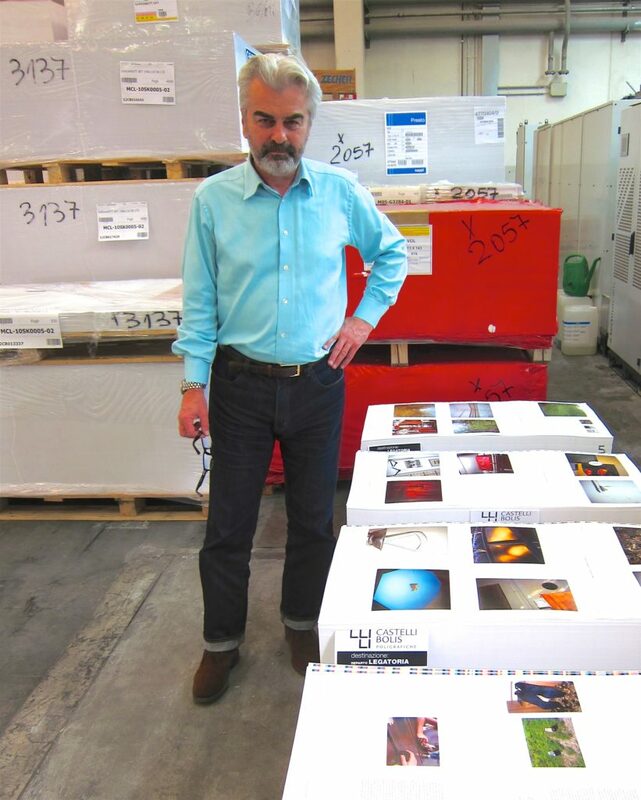 He moved to London in 1990, subsequently publishing several new bodies of work, including Ice and Water 1993, Deep Blue 1997, Material 2002, and Peter Fraser (Nazraeli Press) 2006. In 2002, The Photographers’ Gallery, London, staged a 20 year survey exhibition of Fraser’s work, and he was shortlisted for the Citigroup International Photography Prize in 2004. In 2006 he was invited to be an Artist in Residence at Oxford University, England and produced new work for permanent installation in their new Biochemistry building in 2008. In 2009 Fraser was given a major commission by The Ffotogallery, Wales, to return to his country of birth, to make new work for a solo exhibition at the gallery, which opened in March 2010, with a new publication, Lost For Words. In 2008 Fraser began working on A City In The Mind a new series of photographs in London, which was shown at Brancolini Grimaldi Gallery, London in May 2012 accompanied by a Steidl Publication. From January to May 2013, Tate St Ives held a retrospective of Fraser’s career, and Tate published a major monograph on the whole of Fraser’s career with a text by David Chandler. Tate purchased 10 works for their permanent collection from the Two Blue Buckets series in 2014. In 2014 Fraser was awarded an Honorary Fellowship by the Royal Photographic Society, UK. In spring 2017 Peperoni Books, Berlin, published a new ‘Director’s Cut’ of Fraser’s 1988 publication Two Blue Buckets with 19 missing images from the original, and a new essay by Gerry Badger and a discussion between Fraser and David Campany. From 1st June to 31st July 2017 Fraser’s exhibition Mathematics was exhibited at the Real Jardin de Botanico, Madrid, part of PhotoEspana 17 and Skinnerboox, Italy, published Mathematics with 52 colour plates, and essays by Mark Durden, David Campany and an afterword by Fraser. The first UK exhibition of Mathematics opened at Camden Arts Centre, London on the 5th July, and ran to 16th September 2018. The accompanying File Note no 120 published by the gallery, featured a specially commissioned essay The Things That Count by Amy Sherlock, Deputy Editor of Frieze. 2018 Mathematics, Camden Arts Centre, London. 2013 Peter Fraser, Tate St Ives. 2012 A City in the Mind, Brancolini Grimaldi, London. 2010 Lost for Words, Ffotogallery, Cardiff, Wales. 2003 The Inconsiderable Things, University of Brighton Gallery, England. 2002 Peter Fraser, The Photographers’ Gallery, London. 1999 Peter Fraser, Gallerie 213, Paris, France. 1997-1998 Deep Blue, Viewpoint Gallery, Salford; Ffotogallery, Cardiff; Cambridge Darkroom, Tullie House, Carlisle. 1996 Deep Blue, Stephen Friedman Gallery, London. 1995 Ice and Water, St Louis Museum of Art, Missouri, USA. 1994 Ice and Water, James Hockey Gallery, Farnham, England. 1993 Ice and Water, Cornerhouse, Manchester, England. 1989 Triptychs, Interim Art, London, England. 1988 Towards an Absolute Zero, Watershed, Bristol, England; Plymouth Arts Centre, Plymouth, England; Ffotogallery, Cardiff, Wales. 1987 Spectrum Galerie, Sprengel Museum, Hannover, Germany. 1986 Everyday Icons, Photographers Gallery, London; Photo Gallery Hippolyte, Helsinki; toured the United Kingdom. 1985 12 Day Journey, Harris Museum and Art Gallery, Preston, England; Axiom, Cheltenham, England. 1984 New Colour, Oldham Art Gallery, Oldham, England; Arnolfini, Bristol, England. 1983 New Colour, The Photographer’s Corridor, University of Wales, Cardiff. 1982 The Flower Bridge, Impressions Gallery, York, England. 2017 'The Photographic I - Other Pictures', S.M.A.K. Museum of Contemporary Art, Gent, Belgium. 2016 'Transiciones', works from the 'Motelay Collection', Circulo de Bellas Artes, Madrid. 'Night in the Museum', curated by Ryan Gander, Yorkshire Sculpture Park, UK, travelling to Birmingham Museum and Art Gallery, and The Attenborough Centre, Leicester. 2012 'Observers: Photographers of the British Scene from the 1930's to Now', British Council Exhibition, SESI-SP, Sao Paulo, Brazil. 'Island Stories: Fifty Years of Photography in Britain', Victoria and Albert Museum, London. 'Intersections-Science in Contemporary Art', Weitzmann Institute of Science, Tel Aviv. ‘I Hate Green’, Ffotogallery Commissions in Wales – Part 1, Turner House Gallery, Penarth, Wales. 2006 Patrick de Brock, gallery artists show, Knokke, Belgium. 2004 Citigroup Photography Prize 2004, Kunst Palast, Dusseldorf, Germany. Citigroup Photography Prize 2004, The Photographers’ Gallery, London. 2003 'Jede Fotografie ein Bild', Seimens Collection, Pinokothek der Moderne, Munich, Germany. 2001 'Nothing', Northern Gallery for Contemporary Art, travelling to the Contemporary Art Centre, Vilnius, Lithuania, and the Rooseum, Malmo, Sweden. 1998 Summer Show, Stephen Friedman Gallery, London. 1994 'Institute of Cultural Anxiety: Works from the Collection', ICA, London. 1993 Patrick de Brock, Antwerp, Belgium. 1992 'Mehr Als Ein Bild', Sprengel Museum, Hannover, Germany. 1991 Pamela Golden, Marcus Hansen, Peter Fraser, Interim Art, London. Curt Marcus Invitational, Curt Marcus Gallery, New York, USA. 1989 Foto Biennale Enschede, Rijksmuseum Twenthe, Enschede, Holland. Through The Looking Glass, Barbican Art Gallery, London. 1988 'A British View', Museum for Gestaltung, Zurich. 'Towards a Bigger Picture', Victoria and Albert Museum, London. 1987 'Inscriptions and Incidents', A British Council Exhibition, P.R.O.K.A, Ghent, Belgium, toured to Luxembourg, Italy and Germany. Sun Life Photography Awards, National Museum of Photography, Film and Television, Bradford, England. 1986 'I Hate Green', The Ffotogallery, Cardiff, Wales. 'New British Documentary', Museum of Contemporary Photography, Columbia College, Chicago, Illinois, U.S.A.
'The Animal Show', Photographers Gallery, London. '50 Years of Modern Colour Photography', Photokina, Cologne, Germany. 1985 'A Sense of Place', Interim Art, London. 'Image and Exploration', Photographers Gallery, London. 'Axiom Review', Axiom, Cheltenham, England. 'Young European Photographers', Frankfurter Kunstverein, Frankfurt, Germany. 2017 'Two Blue Buckets', 'Directors Cut', Peperoni Press, Germany. 'Mathematics', published by Skinnerboox, Italy. 2016 'Mathematics', self published Limited Edition Digital book, London. 2013 ‘Peter Fraser’, Full career Monograph, Tate Publishing, London UK. 2012 ‘A City in the Mind’, published by Steidl/ Brancolini Grimaldi. 2010 ‘Lost for Words’, book published by Ffotogallery, Cardiff. 2006 ‘Peter Fraser’, book published by Nazraeli Press, USA ‘Vitamin Ph: New Perspectives in Photography’, Phaidon, London. 2004 ‘Citigroup International Photography Prize’, catalogue published by The Photographers’ Gallery, London. 2002 ‘Material’, book published by Steidl Verlag, Germany. 2002 ‘PETER FRASER’, book published by the Photographers’ Gallery, supported by the Arts Council of England. 2001 ‘Nothing’, book published by August and Northern Gallery For Contemporary Art, Sunderland, England. 1999 ‘Peter Fraser’, Galerie 213 exhibition catalogue, published by Galerie 213, Paris. 1997 ‘Deep Blue’, published by Viewpoint Photography Gallery, Salford; Ffotogallery, Cardiff; Tulli House, Carlisle; and Cambridge Darkroom Gallery, England. 1995 ‘Currents 63’, Ice and Water exhibition brochure published by St. Louis Art Museum, text by Olivia Lahs-Gonzales. 1993 ‘An Uncertain Exchange’, Jeremy Millar, for Ice and Water catalogue published by James Hockey Gallery, Farnham and Cornerhouse, Manchester, England. 1988 ‘Towards an Absolute Zero’, Rupert Martin, catalogue published by Zero Press, Bristol. ‘Two Blue Buckets’, Rupert Martin, published by Cornerhouse, Manchester. 2018 Amy Sherlock, 'The Things That Count', Camden Arts Centre, London, File Notes, no 120. 'Renewed Blue Buckets', Annual Photographer's Lecture 2016, pp.12-17, and 'Mathematics' pp.18-23, Scottish Society for the History of Photography, Summer 2017 publication, Glasgow. Alexis Fabry and Maria Wills, 'Transiciones', La Fabrica, Madrid, and Toluca Editions, Paris, pp,22, 23, 142,148. John McLean, 'Hometowns', Hunter and James, London, pp multiple, un-numbered. 2014 Mark Durden, ’Peter Fraser’, Photography Today, Phaidon Press, 2014, pp. 126-129. 2013 David Chandler, 'Peter Fraser, Photographs 1981-2012’ monograph, Tate Publishing 2013. John Burnside, Tate Etc, Issue 27, 2013, ‘A Liberation From the Ordinary’. 2012 Adam Bell, ‘ A City in the Mind’, Photoeye, New York, blog 5th November, 2012. Alex Coles, ‘Architecture with Art in Mind’, Salt Bridges, Prestel Publishing Ltd, pp120 text, and pp88-113 images. 2009 At The Ruskin’, Oxford Poetry magazine, Magdalen College, Oxford University, Spring 2009, Vol.X111no1, pp 31>32 text, and 4 page colour insert. Peter Fraser, ‘Oxford University Residency’, Photoworks Magazine, Brighton, UK, Spring/Summer 2009, pp 28-37. 2008 ‘Máquinas’ (Machines), EXIT Magazine, Madrid, Issue 31, cover and pp. 130-137. ‘Troubled Waters’, 12 Still Lives from the Siemens Photography Collection, Walther König, Köln, Germany, cover and pp. 76-79. ‘No Such Thing as Society’, Photography in Britain 1967-1987, Professor David Mellor (author), Hayward Publishing, pp. 127-131, 133-135, 146. 2007 Gerry Badger, ‘The Genius of Photography, Quadrille Publishing, London. pp. 212. David Chandler, ‘Peter Fraser’, Photoworks Magazine, Brighton, England. May/October 2007, p74. Aaron Rothman, ‘Peter Fraser’, Photo Eye Booklist, Santa Fe, New Mexico, Spring 2007, pp. 20-22. Edgar Allen Beem, ‘Close Encounters With The Overlooked’, Photo District News, New York, July 2007, pp 82-86. 2004 Charlotte Cotton, ‘The Photograph As Contemporary Art’, Thames and Hudson, pp. 126-127. Heinz-Norbert Jooks, ‘Citigroup Photography Prize Exhibition’, Kunstforum 171, July/August 2004, pg 326. Michael Bracewell, ‘Peter Fraser photographs 2002-2003’, Portfolio Magazine, no 39, pp. 8 -13. Ian Jeffery, ‘Review Citigroup Prize’, Photoworks Magazine, Spring / Summer 2004, pp 54-57. Interview with Rachel Withers, ‘Peter Fraser Material’, FOAM Magazine, Issue 5 ‘Near’, pp. 99-117. Johanna Burton, ‘Tiny Jubilations’, Citigroup Photography Prize 2004, published by The Photographers’ Gallery, pp38-39. Oliver Bennett, ‘Out of the Ordinary’, Design Week, 8 January. Adrian Searle, ‘Smashing Pumpkins’, The Guardian, 29 January. Ben Lewis, ‘Photography Triumphant’, Prospect, February. Sean O’Hagan, ‘Drive to the Edge’, The Observer, 1 February. Sarah Kent, ‘Citigroup Photography Prize’, Time Out, 18 February. 2003 Johanna Burton, ‘A Few Dumb Ideas On Peter Fraser and Rachel Harrison’, Brighton Photo Biennial 2003 Publication (with Photoworks), pp. 10- 13. 2002 Gerry Badger, ‘Peter Fraser Material’, Next Level, Edition 02, Vol 01, pp. 42-29. Paul Tebbs, ‘Technological Confectionary’, Source, Issue 32, Autumn 2002, pp. 52-53. Geraldine Haigh, ‘Chromatically Correct’, Professional Photographer, August 2002, pp. 45-48. 1999 Sleazenation, January 1999, pp. 48-57. 1998 David Mellor, ‘British Photography: Towards A Bigger Picture’, Aperture Magazine, New York, pp. 57-61. 1995 Robert Duffy, ‘Fraser’s Different Focus’, St. Louis Post-Dispatch, 20 August. 1994 Ian Jeffrey, ‘Peter Fraser’, Untitled Magazine, Spring; p. 17. 1993 Mark Durden, ‘Ice and Water’, Creative Camera, Dec; p. 42. 1989 David Mellor, ‘Coincidenta Oppositorum’, Exhibition sheet, Interim Art, London. Sue Hubbard, ‘Peter Fraser – Triptychs’, Time Out, 26 July. Mary-Rose Beaumont, ‘Peter Fraser’, Arts Review, 28 July; p. 42. 1988 Ian Jeffery, ‘British Photography Flourishes’, Camera Austria, No 25, pp. 58-61. Ian Jeffrey, ‘Unrepentant Roses’, Creative Camera, December; p. 34. David Mellor, ‘Romances of Decay’, Aperture, New York, Autumn, p 34. 1987 Ian Jeffery, ‘Inscriptions and Inventions’, British Council Catalogue; pp. 14 -15. 1986 William Bishop, ‘Photographs by Peter Fraser’, Creative Camera, May; pp. 18-25. Susan Beardmore, ‘I hate Green’, Valleys Catalogue, Ffotogallery, Cardiff.